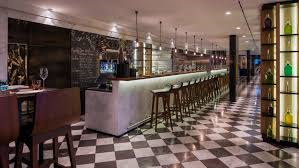 I know men and women who, especially when eating alone, prefer sitting at the bar in a restaurant. 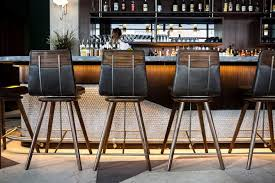 Look at the images of comfortable seating that illustrate this post. Clementine Crawford, a well-travelled executive does and during many visits to the Big Apple she sat at the bar at her favorite watering hole: Restaurant Nello on Madison Avenue. On her last stopover she was told to get up from the bar and to sit at a table. The bar was suddenly off limits to women alone at this Italian eatery–which is no neighborhood pizzeria. Google touts it as a place “only for Jay Z or Russian billionaires,” which given its reputation for charging $275 for a plate of white truffle pasta is no surprise. Men could eat alone at the bar Crawford observed on a second visit. Having been evicted from my favorite perch I wouldn’t return to this place. This is New York City: We have 24,000 restaurants here, according to one estimate, and I’m sure a few would charge hundreds of dollars for a plate of pasta to satisfy the insecure. 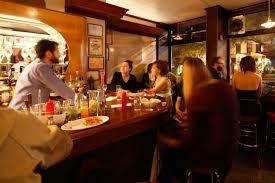 Restaurant Nello, with its bar rule, has propelled us back to the Victorian era. Was this a clumsy attempt by management to generate publicity? 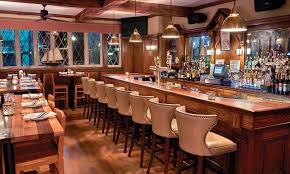 Do you like to eat at the bar? Why do people agree to subject themselves to such arrogance at any price? Have you heard of rules like this in other restaurants in this country? I’ve lived in Manhattan and Brooklyn much of my life and I’ve always noticed at least one mystery character in every neighborhood. Nightly I walk home from the office on the west side of Second Avenue. 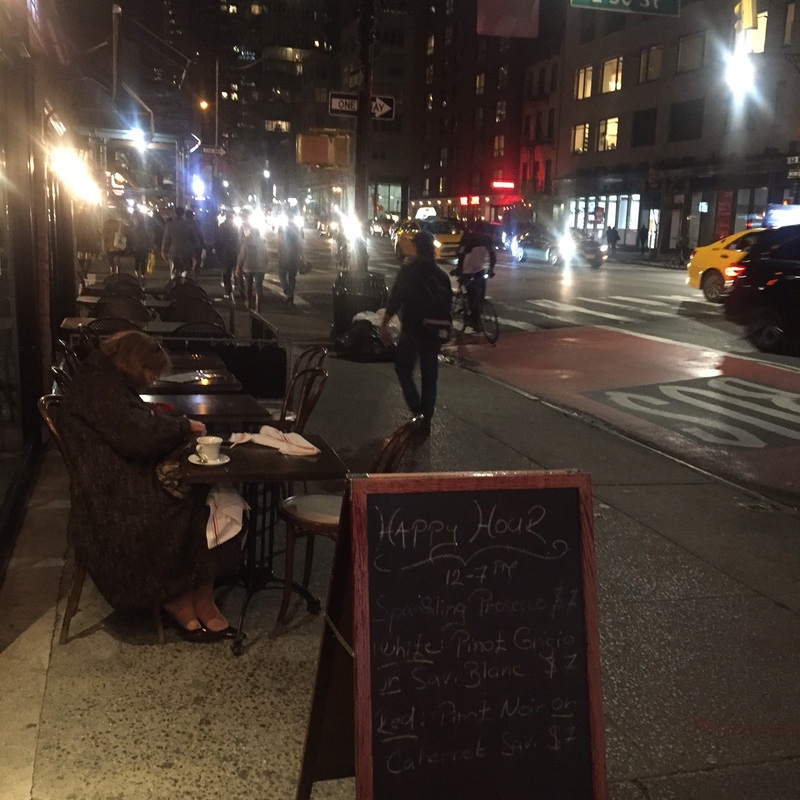 There’s a stretch of restaurants with outdoor seating between 50th and 51st. All summer I noticed an elderly woman at the same spot, either working on a crossword puzzle or hunched over her mobile phone as she is in the photos above and below. There’s a drink on her table–maybe a cocktail–and a napkin on her lap. Perhaps she has already eaten or is waiting for her food as I’ve never seen a plate. I noticed her because she was impeccably coiffed and expensively clad in a summer suit or dress with coordinated sweater, shoes and handbag–a different ensemble each time I saw her–and always alone. She was also much older than any of the diners around her. Once I stopped to tell her I admired her fashion style and kept going. In summer, foot traffic is brisk on the slim slice of sidewalk that tables and chairs don’t hog. This doesn’t allow for hesitation by pedestrians rushing past in both directions. 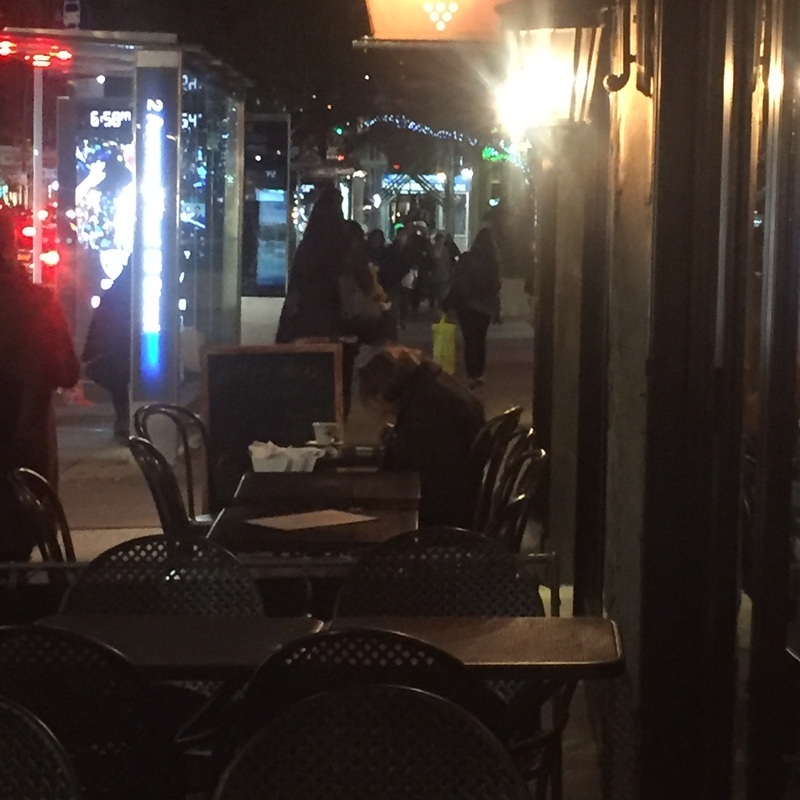 It’s cold now but the outdoor tables were still in place last week and she was the only person at one of them in the lineup of restaurants one night. It gets dark early so she was sitting in obscurity, stooped over her phone, oblivious to passersby, honking and traffic. Her hair was windblown and instead of a drink, there was a coffee cup on the table. I like to guess about neighborhood characters like this. Where does she live? What did she do for a living? Do her clothes fill all the rooms in her apartment or does she have many closets? It’s fun to make up positive stories. Are there strangers who pique your curiosity in your neighborhood? Are they more obvious in a city as walking slows motion and better allows for observation than when you’re driving through town in a car? There are great things to do that don’t cost a fortune when you visit New York City at this time of year. Here are a few and some tips of what to watch out for. Stroll Grand Central Station to see the remarkable architecture and on the ground floor a tourist information window with maps and useful free guides. There are plenty of shops—visit Cursive for gifts and cards—and kiosks with NYC-made merchandise as well as pricey food stalls upstairs and prepared takeout downstairs with plenty of seats. Mendy’s hotdogs are worth a detour. The price is right for a brownbag lunch in Bryant Park behind the 42nd Street Library. Find a chair and table under a tree, catch a breeze and watch the scene, a game of ping pong or bocce. A short stay is restorative. Fruit stands all over the city sell cherries, raspberries, grapes, figs and more at amazing prices. If you’re near Union Square, drop in on Trader Joe’s wine shop on east 14th Street and the food store a few doors down for treats, serious food and polite service. If you want to stock up on a few cases of wine note that you can’t park for even a minute in front but ask a staffer to load your purchases on a hand truck. They’ll walk the cases to your vehicle. As in all my favorite cities, walking is the best way to get around. New Yorkers can be testy when they can’t negotiate a cluster of people stopped in the middle of the sidewalk so best keep walking or go to the side to get your bearings or regroup. Read a map on the sidewalk and I bet someone will stop to guide you. A ride on the Staten Island ferry is free; the view of lower Manhattan priceless. Avoid taking rip off pedicabs. I’ve written about them and several times about the bicycle sharing program. I can’t recommend that tourists rent a bike unless they know the traffic rules and are used to riding in vehicular and foot traffic in a city packed with impatient residents. Take care that your taxi is charging you the city rate. You’ll know if the meter is set at the higher suburban rate, wrote Rebecca Harshbarger in the New York Post, if you see a flashing “rate code 4” message on the TV screen in front of you. [I don’t recall ever seeing it.] She referenced a scandal four years ago when cabbies were caught stealing $millions by up charging the meter. Last year the Taxi and Limousine Commission [TLC] caught drivers overcharging 659 times vs. 2,000 the year before. “The agency uses a GPS-data algorithm that analyzes trip information to catch rogue drivers, who are then automatically hit with a summons,” wrote Harshbarger—a trend going in the right direction. What are your must-visit places in NYC or best warnings for visitors and residents?